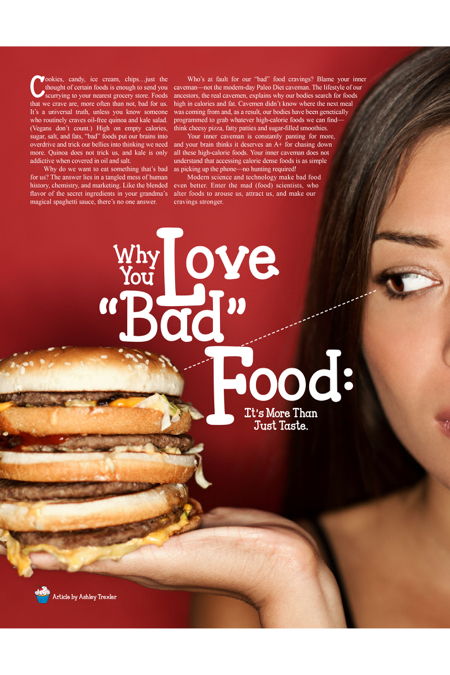 Hilton Head Magazines: CH2/CB2: Why You Love “Bad” Food: It’s More Than Just Taste. Cookies, candy, ice cream, chips…just the thought of certain foods is enough to send you scurrying to your nearest grocery store. Foods that we crave are, more often than not, bad for us. It’s a universal truth, unless you know someone who routinely craves oil-free quinoa and kale salad. (Vegans don’t count.) High on empty calories, sugar, salt, and fats, “bad” foods put our brains into overdrive and trick our bellies into thinking we need more. Quinoa does not trick us, and kale is only addictive when covered in oil and salt. Why do we want to eat something that’s bad for us? The answer lies in a tangled mess of human history, chemistry, and marketing. Like the blended flavor of the secret ingredients in your grandma’s magical spaghetti sauce, there’s no one answer. Who’s at fault for our “bad” food cravings? Blame your inner caveman—not the modern-day Paleo Diet caveman. The lifestyle of our ancestors, the real cavemen, explains why our bodies search for foods high in calories and fat. Cavemen didn’t know where the next meal was coming from and, as a result, our bodies have been genetically programmed to grab whatever high-calorie foods we can find—think cheesy pizza, fatty patties and sugar-filled smoothies. Your inner caveman is constantly panting for more, and your brain thinks it deserves an A+ for chasing down all these high-calorie foods. Your inner caveman does not understand that accessing calorie dense foods is as simple as picking up the phone—no hunting required! Modern science and technology make bad food even better. Enter the mad (food) scientists, who alter foods to arouse us, attract us, and make our cravings stronger. According to food scientist Steven Witherly, Cheetos are the perfect junk food. It’s not just the taste. Cheetos melt in your mouth and trick your brain into thinking it’s not eating—so you eat more. Food scientists call this vanishing caloric density. Then there’s the fat in the powdered cheese that emulsifies and spreads across your taste buds, delighting your senses. That’s your salivary response. Don’t forget dynamic contrast. Food that is crunchy on the outside and light and airy on the inside makes the pleasure center of your brain light up like a Christmas tree. Labs across the world spend millions programming foods like these. It’s not just traditional junk food that’s being manipulated, either. Take Greek yogurt. Healthy, right? Not so fast. Functional medicine nutritionist Angela Pifer breaks down the amount of added sugar in flavored Greek yogurt. Added sugar means someone, somewhere kept adding sugar until the food product reached optimum taste levels. What’s optimum taste? Whatever the food testers at the lab vote is best: the perfect mix of sweet and salty, heavy and light, crunchy and soft. Pifer explains that every time you chow down on a “healthy” 5.3-oz. container of Oikos Greek yogurt, berry flavor, you’re ingesting over three teaspoons of added sugar. Dump three teaspoons of sugar into a no-sugar added yogurt and you would still need to add more to experience the same sweetness. And don’t forget the two teaspoons of naturally-occurring sugars. Natural yogurt is not bad for you. What is bad for you is the food scientist sneaking teaspoons of sugar into yogurt and marketing companies branding this poor food choice as a good one. Sugar may be our worst enemy. If you crave sweets, sit up and pay attention. For those of us predisposed to developing Alzheimer’s, dementia or diabetes, sugar is especially dangerous. It’s your brain’s drug of choice. Alzheimer’s patients are known for their voracious sweet tooth. Anything that spikes your blood sugar (even whole grain bread) encourages inflammation and toxins, like plaque, to build up in the body. Buildup leads to your body breaking down. It’s a vicious cycle. Does that mean we avoid yogurt because of its natural sugar? No. But we should tape our mouths shut to avoid eating modified yogurt and manipulated foods that are filled with sugar, salt, and empty calories. We should be aware that food scientists, brands, and marketing companies earn a living making food taste better and getting us to buy more of it—usually by making it less healthy. Before you dive into a bowl of ice cream to drown your sorrows, there’s good news. Even the biggest junk food addict will notice a decline in cravings if the food is not accessible. Stop buying it. Stop stocking it. Stop eating it. And oh so slowly you’ll stop craving it. Easier said than done. Craving bad food is more than just chemistry and carb-to-sugar conversions. Genetics, family history, and instant access all play important roles. We need an easier way to eliminate cravings. We need an app: Weight Loss Lock, guaranteed to lock your wallet so you can’t spend your hard-earned dough on cookie dough. One app could break the cycle, except…May I borrow a few bucks? I have to run to the, um, store. Until we have an app that stops cravings in their tracks, follow one rule: If you’re craving it, question it. You don’t need an app for that.